The 360-degree feedback approach can be a more efficient, accurate, and effectual alternative to a rating-based performance appraisal system currently used by most organizations. Employee performance management is a critical function in any organization, whether large or small. Moreover, it plays an important role particularly in enabling an organization to achieve its business goals successfully- both long-term as well as short-term. However, performance management or reviews should not only focus on the high performers, but also on enhancing and optimizing the performance of the entire team. Effective and outcome-oriented performance management involves ensuring consistency among those performing well as well as helping those employees with average metrics to improve their performance. Reviewing employee performance, in an effective and constructive manner, also requires managers to exercise objectivity and make unbiased decisions. For this, they need to strike a balance between providing an honest assessment of an employee’s work and guiding them on how to go about enhancing their performance. This is imperative to ensure that the organization is on course to achieve the business objectives. Adopting a 360-degree feedback approach can be a more efficient, accurate, and effectual alternative to a rating-based performance appraisal system currently used by most organizations. A number of companies with the focus on facilitating a holistic development of their employees have already begun using the 360-degree review to analyze and evaluate their employees’ performance and leverage the untapped potential in them. A comprehensive appraisal system wherein the feedback on employees’ performance is based on all areas and forms of interactions they are involved in within the organization; the 360-degree performance review is being used by leading corporations like Maruti Suzuki Motors and HCL, among others. 360-degree performance reviews can prove to be a very useful source of real and reliable data about employees’ performance. As employees are involved in the evaluation process in most cases, the feedback results are reliable and free of individual biases. Moreover, this system also allows employees to plan how they will enhance their performance and productivity through a detailed personal development plan created based on the feedback received. At the same time, the results and feedback from the performance review are considered to make decisions regarding the level of remuneration hike to be given to the employee- whether they are to be promoted or need further training and mentorship. How can organizations make 360-degree feedback truly work? The primary objective behind adopting a 360-degree feedback system is to make ‘taking action’ on results easier for both the managers as well as the employees. 360-degree feedback reports are typically filled with pages of graphs, charts, comments, etc. However, it is almost impossible for managers to study them without the help of HR or training coaches. Thus, in order to make this feedback system work better for managers, there should be a set of clearly defined guidelines on what aspects of the report- the managers should focus on when reviewing employees. Guide, don’t rate: A typical 360-degree review will rate employees based on how good or bad they are at a particular skill, which usually doesn’t do much regarding leading a real change. What managers and performance reviewers can do is use a scale to assess various behaviors of employees and tell them accordingly what they need to ‘do more’ or ‘do less’ of. At the same time, managers should avoid the use of self-ratings or comparisons with peers for the review process. This is because, on the one hand, such ratings are seen to make employees resistant to change when they score as per their expectations, while on the other, they do little in terms of motivating them further if they score below their expectations. Focus on a few top behaviors only: Managers and leaders are usually too busy to scan through lengthy and detailed reports to identify what behaviors to focus on. Thus, it is a more efficient practice to summarize the feedback to list the most crucial behaviors to improve or specific actions to be taken. A well-designed 360-degree performance report should also provide specific recommendations from the reviewers on how exactly the managers must go about training employees and facilitating a change in critical behaviors effectively. A 360-degree performance management system offers an efficient and credible system for assessing employees. It can be an effective tool for employee development when conducted at regular intervals and goes a long way in enabling organizations to meet their short and long-term business goals. 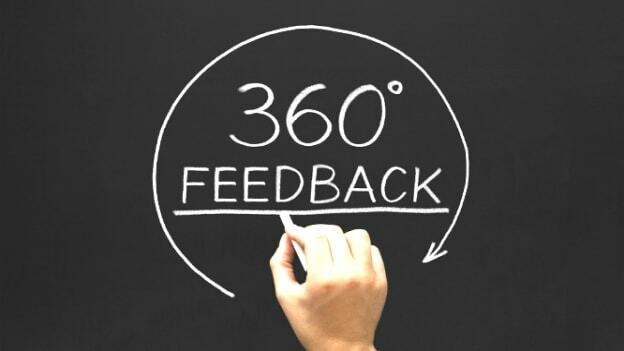 The key to making 360-degree reviews work is to consider it a technology tool much like any other digital or IT systems deployed to boost efficiency in the organization. When done right, it can help organizations build a productive and motivated workforce by combining the review system with continuous L&D programs- developing high-potential employees and capable leaders.